illuminated in Simon Bening's workshop. Flanders, Bruges , c. 1510-1520. Two beautiful miniatures from a Book of Hours, illuminated in Simon Bening's workshop. Two miniatures. Tempera, gold, and ink on vellum. 110 x 65 mm each. Mounted together in one frame. These works have been sold. These two miniatures derive from the same Book of Hours; originally they preceded Matins and Lauds. Both compositions are dominated by a brilliant and striking blue of Mary's garment. The subtle and circumspect way of outlining narrative details and the delicate and affectionate modelling, as well as the attention to interior and landscape, respectively, recall strongly the celebrated Bruges illuminator Simon Bening (1483-1561). 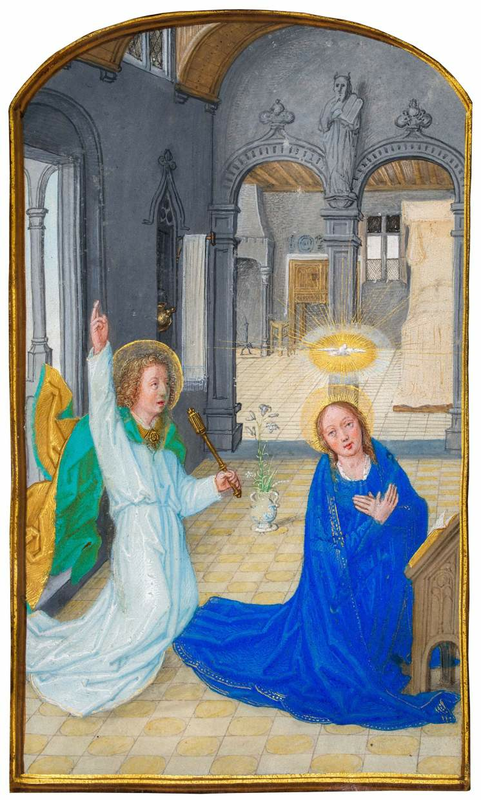 Annunciation: In this lovely rendering of the traditation Annuncation scene, the archangel Gabriel's superb and flamboyant, golden and green cape emphasizes the rapid movement with which he approaches the praying Virgin. In contrast, Mary is calm and composed, humbly crossing her hands before her chest in the well-known gesture of acceptance: "ecce ancilla domini" ('I am the Lord's servant'). The Dove of the Holy Ghost, in a golden aureole, hovers over her head, while a pillar statue of Moses holding the Ten Commandments surveys the entrance to Mary's bedchamber, into which the beholder is allowed to peer. The artist affectionately outlines many domestic details, giving proof of the painter's fondness for narration. Visitation: Mary's encounter with her older cousin Elizabeth (the future mother of John the Baptist) takes place in a wide, open landscape. Again, the Virgin is highlighted by her brilliant blue dress, while Elizabeth is convincingly characterized as an elderly woman by her stooped posture, as well as by shadows and lines around her eyes. In her intricate outfit and animated and welcoming gestures, she represents a counterpart to the Virgin (similarly to Gabriel in the Annunciation), who is again composed and introverted. Mary casts down her eyes and responds to her cousin's enthusiastic salutation with only a temperate gesture of her hand.